What are Battle Games & Medieval Combat Sports? 2.2 – 4lb foam cores for durability and longevity. We chose the higher density foam blanks for tower shields as it provides similar rigidity to a cored shield, while still having the mobility and weight of a coreless. Most rounds are made with 2.2.
shield is edged in 1/3inch 4lb MC foam (puzzle Matt) and 1inch 2lb. microcell Polyethylene foam, the same foam most people use for use for weapon striking surfaces. For strap shields I recommend PtQ’s method for adjustable straps and can be used either righty or lefty (rounds), and on most arm sizes. face the shield with 1/8th MC foam, known as “craft foam”.you can get 3 by 5 ft rolls online or at Michaels super stores. Shield blank edged and waiting for straps and facing. Once assembled, you can carve wood grain designs orrr any pattern you choose into the foam face by using a soldering iron, a wood burner, a foam carving knife, or a dremmel tool. This complex design uses 2 widths of foam to add even more dimension. To add sculpture, use puzzle mat or craft foam and glue with DAP contact cement. For any sculpture that is larger or lifting slightly, such as woven knots, use e6000 glue. Remember that this glue needs pressure to adhere, so if it is not a heavier model magic clay element, place a weight on it to dry, or use straight pins to hold it down. Once the sculpture is finished and the edging has been added, move onto the Plastidip stage. Use 2 spray-on cans and 1 paint-on can of PlastiDip on each shield 24”- 28” round. Start with a layer of spray pd. 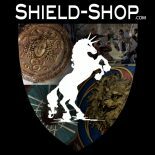 For shields with model magic sculpture you may need to do multiple thin spray coasts to cover completely, plastidip can slide off the sculpt while drying. Don’t worry, it will coat it and stay, it is just finicky. After the first layer(s) of spray is dry, use a foam brush to paint on a layer of paint on dip. Start in the middle and go out. Use a can of spray Plastidip periodically during this step to help the paint on level out and to avoid brush marks. I typically think of the shield like a target, and spray my painted on dip layer every time as go out not here “ring”. Make sure to add a lot of paint on to th outside edge especially, as that is gets hit the most in game. Finish with a spray on layer. Repeat this process until you have used all of your dip. If you think it may need more, ADD MORE. 3 cans is just a guideline. Once the PlastiDip is dry lay down base coats before starting detail painting. Detailing is what brings out the layers. The paints we use are a combination of exterior/interior spray-paints and acrylics. Multiple “washes,” or layers, is the key to a believable finish. Starting the first of 5 washes on the metal. After all this is done it is sealed with a rubberized roof sealant (Through-The-Roof) to help protect the shields from weather. Or use Leak Stopper CLEAR. For more info on our process, please feel free to contact us, and visit our Resources page for more.